The 2007 Mustang GT has two options packages: the deluxe and premium. Both packages include the 4.6 liter, over-head cam, 3 valve, V8 engine; stainless steel dual exhaust; TR3650 5-speed manual transmission; fog lamps; rear spoiler; performance tires; 17 inch premium painted cast aluminum wheels, and power adjusted 6-way drivers seat with power lumbar. The GT deluxe package comes with the standard stereo and cloth seats while the GT premium package comes with the Shaker 500 audio system and leather seats. How's this for a cool shot! It's Frank Szymkowski's Redfire 2007 Mustang GT convertible. Frank tells us, "I have owned the car for two years and have enjoyed it and shown it at local shows the entire time. What makes this car rare is the combo of the rear spoiler delete, Redfire paint(last year for this color), and chamois premium interior package (first year available). This is the only year that this color combo was made. Speaking to Ford they estimate that no more then 15 were made like it." Equipment includes 5-speed manual transmission, heated seats, IUP (Interior Upgrade Package), PTP (Premier Trip Package), 18-inch polished wheels, side air bags, Shaker 500 sound system, wheel locking kit, active anti-theft system, and racing GTA mufflers & X-pipe. Tungsten Gray 2007 Mustang GT coupe owned by Michael Dale from Bristow, Virginia. This was our featured Attitude Of The Week starting July 4th, 2010. Michael adds, "The emblems have been removed from the fenders and trunk lid and the holes filled. The black is all painted with DuPont Hot Rod Black. I have added a 76MM turbo charger to the car as well as upgrades to the drivetrain, suspension, exhaust, etc. The car with 7psi makes 454RWTQ and 434 RWHP." Alloy 2007 Mustang GT coupe owned by Callie Fry from Illinois. This car was on display at the 175th Anniversary of the Founding Of Princeville Illinois car show (summer 2012). It has late model Shelby wheels and a supercharger! Black 2007 Mustang GT with a 300hp (at 4500rpm), 4.6 liter, V8 engine and optional 18" polished aluminum wheels with pony emblem. This Custom Grabber Orange 2007 Supercharged Mustang GT coupe is owned by Bill Pletcher of Lebanon, Pennsylvania and is our Attitude Of The Week for the week of the 13th of May 2012. Bill belongs to the Berks County Mustang Car Club, who took this photo. The customization was done by ProTune Performance Inc. of Lititz, Pennsylvania. Visible in this photo are the 18" Chrome GT4 wheels and Sumitomo HTR Z11 255/45/18 tires, 12 inch painted racing stripes, Razzi front chin spoiler, Roush side skirts, CDC side scoops and Painted Mirror Covers, Roush quarter window panels, Chrome Cobra Billet fuel door, and custom painted front grille running Pony. Check out all the photos for other upgrades under the hood and inside. Black 2007 Mustang GT Deluxe coupe owned by Brian from Hurricane, West Virginia. He has owned it since September 2011. It has the 4.6L V8 and a manual transmission. Brian says that his modifications are designed to give the look and feel of the late 60's Mach 1s. Alloy 2007 Mustang GT coupe owned by Stephen Morton from Clearwater, Kansas. It has the 4.6L V8 and a manual transmission. Stephen tells us, "I always wanted a Mustang. It was my dream car for as long as I could remember. I bought my Mustang off of an engineer who wanted to sell it so that he could buy a Chevy Corvette. I immediately fell in love with her. I always wanted a Roush charged Stang but could never afford one. Instead, I decided to apply a Roush body kit and give my gal the super sleek look of the Roush pony. I also installed sequential tail lights and angel eye headlights. I gave her the nickname Stang Thang, it seemed to fit the sleek look. I have had her for 3 years now." Grabber Orange Tommy Pike modified Mustang GT with custom wheels, side panels, all blackened grille, matte black hood, deep tinted windows, just to name a few. This absolutely beautifully modified Mustang was our Attitude Of The Week for 11-18-2007. Black 2007 Mustang GT coupe owned by Sal Jr. Check out the green stripes, mirrors, rockers, and chin spoiler. This is our featured Attitude Of The Week for the week starting March 10, 2013. Under the hood is a worked 4.6L V8 engine. It has a manual transmission. Check out this custom Black 2007 Mustang GT coupe. It's owned by Cal Pony Cars in Ontario, Canada. Owner tells us more about this unique GT, "This 2007 Mustang GT Premium Edition Coupe was featured at the SEMA Show in 2007 and 2008 and in Mustang Monthly Magazine (April 2008) as the centerfold. This car was used as a private company show car for product development and shows only. Its easy to say this car was far ahead of its time. It is a one owner car that still has that new car smell. 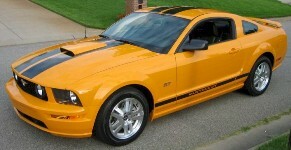 You will not find a 2007 Mustang GT nicer and newer than this one! It only has 10,763 miles on it and has a 5 speed manual trans. Modifications done to the vehicle include: complete NXT Generation engine dress up kit, NXT Generation hood lift kit, custom leather interior accents, custom -20 staggered fit wheels with custom red striped tires, custom GT badges, Volant cold air intake, Volant axle back exhaust system, Vogland performance lowering springs, rear window wing, 3 piece rear deck lid wing, CDC front chin spoiler, Ford Racing strut bar, custom built fuel cap, tinted windows, chrome tail light bezels, and shorty antenna. Every service has been done on time and by a Ford Dealer. This promo car has been stored indoors since new which has left the paint looking perfect. This custom show car has been babied since it was bought off the lot." Windveil Blue 2007 Mustang GT coupe owned by Brian from Laytom, Utah. This is our featured Attitude Of The Week for the week starting February 9, 2014. Brian tells us more, "I bought the car bone stock in 2008, with 645 miles. Since then I have added the following; Procharger D-1SC (12psi), Ford Racing intake manifold, Ford Racing throttle body, Ford Racing 3.73 gears, MAC long tube headers, MAC Prochamber, Aeroforce fuel rails, GT500 fuel pump, HID lights, 18x10 Bullets in rear / 18x9 Bullets in front, Cervinis side exhaust kit, Pepper Gray stripes, GT500 rear spoiler, and BMR suspension all around. This car is a blast to drive. It currently has 38000 miles and been all over from New Mexico to Virginia." Alloy 2007 Mustang GT coupe owned by Luis from Dubai, United Arab Emirates. Mods include; JLT Series 3 CAI, BBK headers and high flow cats, Borla axleback mufflers, SCT XCalibrator 3 custom tune by L&R performance, Ford Racing assembled handling pack plus front arms and Ford Racing strut tower brace, GT500 Brembo brakes, TCI Ratchet Shifter all installed at L&R, Spoiler delete, Lorenzo WL021 20x8.5" rims with 255/35 Nitto NT05, Anzo Projector Halos front, LED tail lights and smoked turn signals +3rd brake light, and Rockford Fosgate 12" Powered Sub. Black 2007 Mustang GT coupe with 20 inch Falken wheels, Borla exhaust, and K&N intake. Customized Black 2007 Mustang GT coupe with Billet grilles, PIAA fog lights, chin spoiler, shaker hood, tinted windows, Foose 20" wheels, duck tail spoiler, lowered and tuned suspension, side window scoops, and Borla exhaust system. Check out this Torch Red 2007 Mustang GT coupe. We saw it at the 29th Annual Central Illinois Ford Day Show and Swap in at Bob Dennison Ford in Bloomington, Illinois. This car had tons of modifications outside, inside and under the hood. An Alloy 2007 racing Mustang GT coupe with custom wheels, rear spoiler, graphics, interior, engine, and other modifications from the 2007 SEMA Car Show. Photographed by Wes Ames.